Side A: Diomedes battles Aeneas in a scene from Homer's Iliad. Aeneas is wounded by in the thigh by the Greek hero Diomedes. The goddess Athena--equipped with spear, helm and aegis cloak--supports the hero. Aphrodite rushes forward with arms outstretched to rescue her son but will be wounded in the arm by Diomedes. 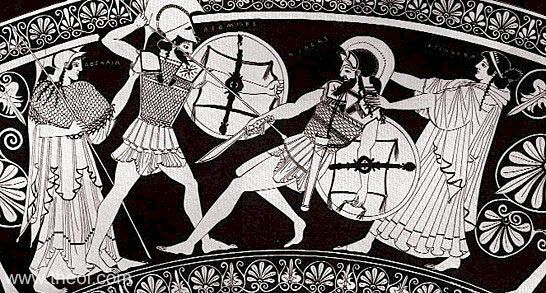 Side B: Achilles battles Memnon (see other image). This a drawing of the vase rather than a photograph.